The AmazonBasics has a 0.5 cubic feet capacity, more than enough for a few pistols, ammo, cash, jewelry, and other valuables. The interior space is 13.5 x 8.75 x 9.5 inches (L x W x H), so that tells you how roomy it is. Aside from guns, you can also put passports, documents, legal papers and more. The exterior dimensions are 13.8 x 9.8 x 9.8 inches, so it’s more compact than the average gun safes. With this size, it should not pose any problem when it comes to carrying this with you. The AmazonBasics safe is made of heavy-duty steel. It is pry-resistant, built for long-term use and is solid. Even with repeated attempts at prying, the housing holds up and keeps the items inside protected. The safe hinges are concealed and it has 2 live door bolts integrated. This fortification is what gives it the edge compared to the regular safe that just relies on an electronic lock. The AmazonBasics safe has one too, but it doesn’t just rely on that to secure the items inside. Not a lot of buyers take the hinges and live bolts into account, but they play a huge role when it comes to reinforcing the safe. Lastly, the safe has a slick black finish that gives it a stylish look. A look inside the gun safe shows that the floor has carpeting. This is not just for aesthetics, as it is also for protection as the carpet acts as a cushion. When you put a gun, jewelry or other valuables in it, the carpet ensures the finish doesn’t bump into the steel. This is another reason why the safe is ideal for any item that you don’t want scratching. 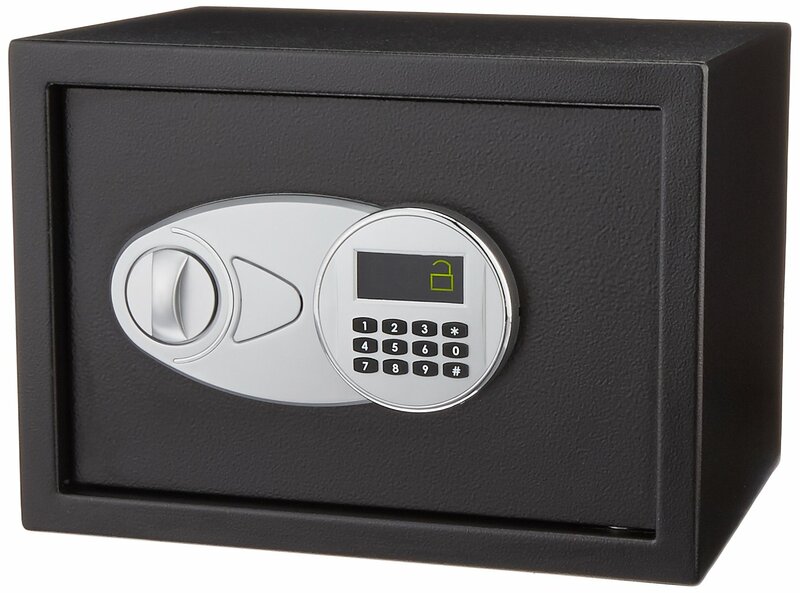 The security safe is fitted with an electronic lock for enhanced security. Setting up is quick and easy and the user guide provides detailed information. All you need to do is install four AA batteries and the safe is good to go. The safe makes it easy to enter your own passcode. Just input your passcode and the safe locks up. To open, enter your passcode using the keypad, rotate the knob clockwise and the safe opens. That’s all there is to it. Only those you provide the passcode can open the safe. What if the batteries suddenly die out and/or you forgot your passcode? No problem as the safe has 2 keys. With these override keys, you?ll be able to override the passcode and open the safe. You can adjust the interior shelf to fit the items you want to put there. You can also remove the shelf easily. The safe has a digital display so you’ll be able to see if the batteries are running low and if the safe is locked or unlocked. The symbols for each one is clear so you won’t mistake them for each other. With a quick glance, you’ll know the state of the security safe. 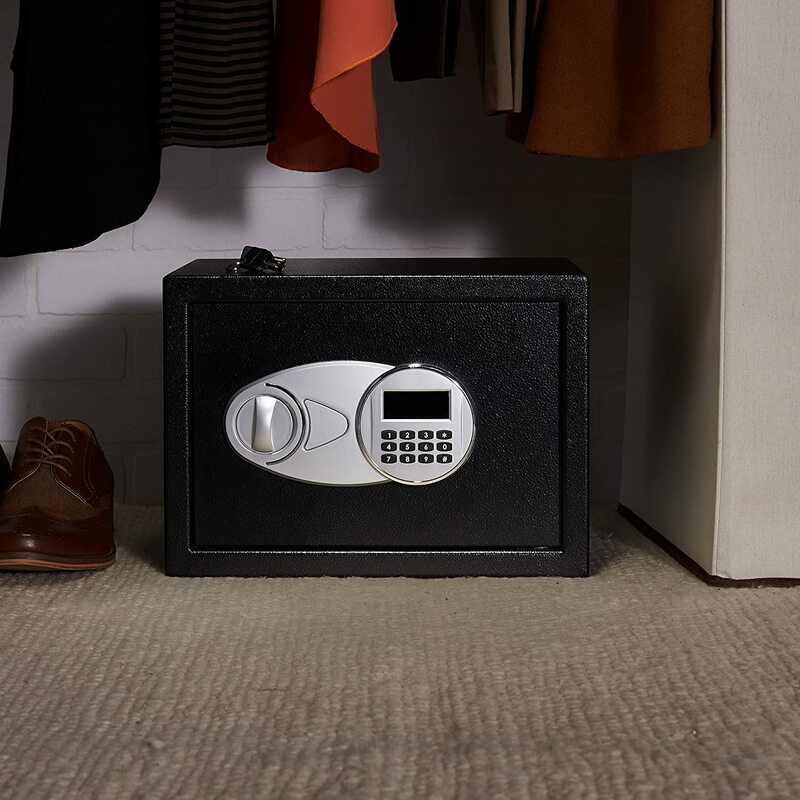 This security safe from AmazonBasics is nothing fancy, but it gets the job done as far as securing your valuables is concerned. It provides a good deal of security features, easy to operate and available in various sizes to meet whatever it is you might require. It is more spacious than your average safe and can be used to store other valuables with your firearm. If you don?t need fancy storage and just want one that keeps your stuff safe and secure without breaking the bank, the AmazonBasics makes for an excellent option. This AmazonBasics security safe review has no hesitation in recommending this.